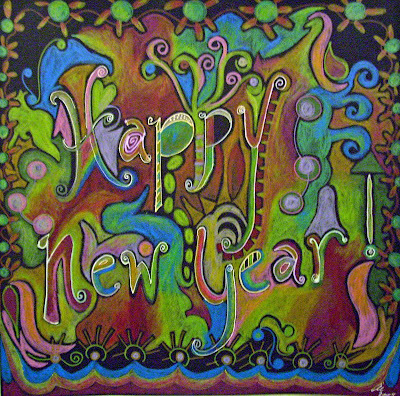 The Artful Eye: Happy New Year! P.S. : I know, I love my little twinkling lights....I may just leave them up all year!! Happy New Year Andrea! Wish you a wonderful new year! Love your doodles! That's a doodle?! Geez. My doodles are still just stick people. Seriously, though, this is a gorgeous doodle, Andrea. Happy New Year to you and yours. May 2009 be a year full of beauty, art, and more doodles! wow ive never had anyone dedicate a doodle to me before. im honored. honest. when i googled sakura crayons and realized they were cray-pas, then i had this whole rush of happy memories of playing with those soft crayons as a little girl. thank you for that too! Please come and 'play' again. The quote reminds me of something I'm reading now too, Roman philosophy from 120 AD! About living closer to who we are, and when we do, more and more moments and we ourselves become in harmony with the laws of the universe. surely you know its me. wishing you a very happy new year Andrea.. Imagine John Lennon "All we need is love"
Super Creative 2009 for all of USA! Happy new year to you too. And great, great page! Wishing you a blessed and creative New Year. Thank you for stopping in and leaving such lovely comments. Wow,cool doodle! Kinda like street art and fireworks all in one! You deserve great things this year...may you go forth and gather! And how did I miss this? am I under a rock? Makles me so happy....just jubilant. Wonderful doodle and wonderful sentiments. It is a beautiful New Year, and this piece says it just right. Beautiful doodles, so vibrant. Such a happy new year post.